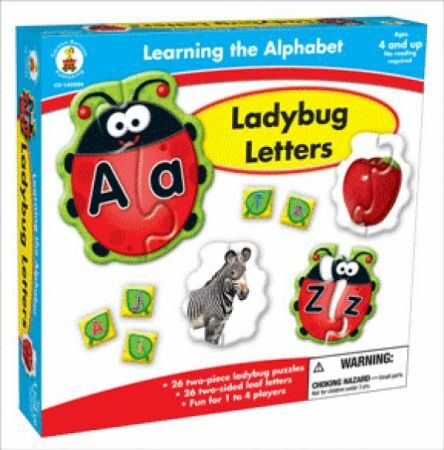 Ladybug letters has 1 set of 26 two-piece ladybug puzzles and 1 set of 26 two-sided letters, each letter printed on a leaf image. The 2 pieces of each pair of ladybug puzzle fit into each other only if they are the correct match, that is when a upper case alphabet matches correctly with its lower case. Also when the match is correct, turn over the completed ladybug puzzle to get a picture of an item that begins with the sound of that letter. The letter leaf image cards can be used to practice alphabet sequencing. For ages 3 - 7.